“Hush” is both a verb and a non, the former to make someone quiet and the latter, a state of quiet, especially if something dramatic occurs: “a hush came over the crowd.” Unfortunately, nothing dramatic occurs here. Hush is dull as dishwater stuff, and critics should hush when it comes to praising it. Kudos to director Mike Flanagan (Oculus) for having a protagonist who’s deaf. 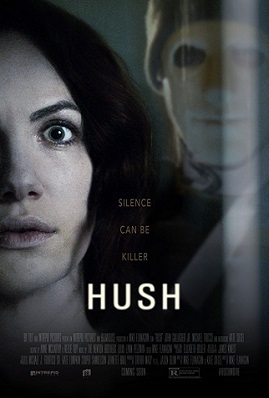 If you place the fingers of your right hand against your lips, this means “bad” in American Sign Language and make no mistake, Hush is a bad movie. A lead character with a disability…now there’s a near sure-fire guarantee critics who’d normally ignore a horror film, will descend from their ivory towers by torchlight to check this one out. Why? Not sure, but the same thing happens with supernatural horrors, lavishly overpraised for their restraint (restraint is a neutral term for horror movies. Sometimes it works, as in the case of Halloween, but just as often it doesn’t, like here. The same can be said about silence. It can be golden, or a pounding soundtrack can be used to ratchet up fears, especially the classic Fulci/Italian stuff). Hush’s setup is pretty great: a deaf writer, Maddie (capably played by Hush co-writer Kate Siegel) is seeking solace in the woods. She’d be there for quiet contemplation if the inside/outside of her mind wasn’t quiet enough. Still, a neat premise. A nearby friend is on hand to set the table, dramatically speaking. Soon, a mad murderer is lurking about in a white face mask, which makes him look like an 8 Mile Maniac. But there’s no Rabbit here. The rest of Hush is stalk-and-slash cat-and-mouse stuff. The killer conspicuously lets the air out of Maddie’s tires and she scrawls defiant messages back to him on sliding glass. He chases her, she pulls a window down on his hand. Meh. One thing that can be said about Hush is that it pretty seamlessly integrates social media / technology.